The Combat Cat is a revolutionary stepped-hull high-speed power catamaran design, configured for military, patrol or SAR use. It offers superior sea-keeping, efficiency, speed and safety in all operating conditions. The Combat Cat is designed to offer multiple mission profile capabilities with speeds of up to 40 knots per hour, using twin outboards. It is ideally suited for rapid response, amphibious deployment of commandos or regular patrol work. Offering significantly less cost and risk than other high-value patrol or combat assets it can provide covert striking power against critical targets, as well as protecting inshore and offshore resources and assets. It can be equipped with enhanced features for special warfare operations, or used for reconnaissance, surveillance, law enforcement, counter-piracy, medical evacuation and rescue operations. This cutting-edge exclusive design incorporates stealth characteristics to minimise radar detection in hostile operating conditions. The Combat boat will have a crew of 4 and is capable of carrying an additional 10-12 fully equipped troops. The foredeck area has a sunken gun-well, suited for installation of a forward/side facing main gun-point, for M240 7.62 calibre, M-60, 7.62mm, 12.7 mm or 40mm grenade launchers. Two large deck hatches and a folding ladder ensure fast and direct access forward, for amphibious assaults and beach landings. The cabin accommodates a Captain/Navigator, helmsman, engineer and gunner, while troops are accommodated in restrained transport seats in the hulls. The stern area of the boat has space for 2 side / rear facing light machine guns and an aft deck in the centre suitable for boarding, or for diving and recovery operations. This is a hi-speed, dual-purpose gunboat and troop carrier. More options for regular naval forces, special forces (Special Boat Service) and Army amphibious forces. 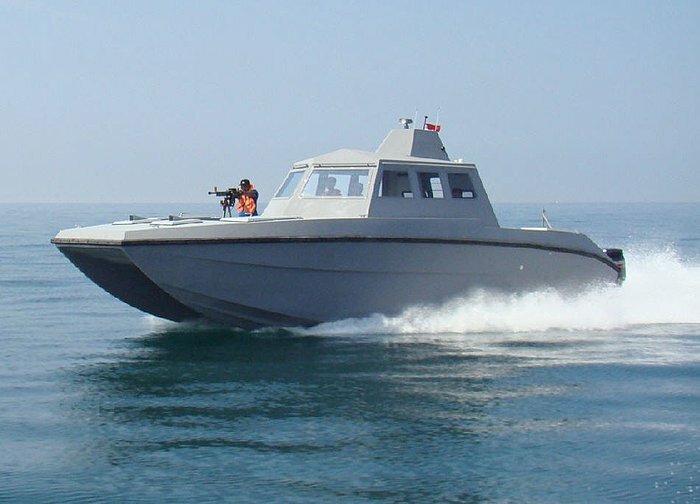 The ultramodern 11.8-meter combat catamarans reportedly went into commercial production in 2009. According to the Company’s website, TP Marine have thereafter been contracted to refurbish six patrol ships for the Nigerian Navy. This entry was posted in AFRICA, AFRICAN ARMED FORCES, ARMED CONFLICT, BORDER SECURITY, COUNTERINSURGENCY OPERATIONS, DEFENCE INDUSTRIES & PRODUCTION, GLOBAL DEFENCE NEWS, JOINT(MILITARY)TASK FORCE IN THE NIGER DELTA, MARITIME SAFETY AND SECURITY, MILITARY HARDWARE, MILITARY PHOTOS, NIGER DELTA CONFLICT, NIGERIAN ARMED FORCES, NIGERIAN ARMY, NIGERIAN NAVY, NIGERIAN SPECIAL FORCES, PIRACY, RISK ANALYSIS, SECURITY ISSUES AND CONCERNS, WEST AFRICAN STANDBY FORCE and tagged ANTI-PIRACY PATROLS, COUNTERINSURGENCY OPERATIONS, MILITARY HARDWARE ACQUISITIONS, MILITARY HARDWARE PHOTOS, NIGERIAN ARMED FORCES, NIGERIAN ARMY AMPHIBIOUS FORCES, NIGERIAN NAVY, NIGERIAN SPECIAL FORCES, TP MARINE, X-38 COMBAT CATAMARAN. Bookmark the permalink. I appreciate the news brother but wake me up when we start buying opvs, frigates, corvettes and submarines. Its some thing, but not close to being enough. Being militarily weak makes one a target of criminals and adventurous nation states. THIS IS NOT A BAD BABY, AT LEAST FOR A START!